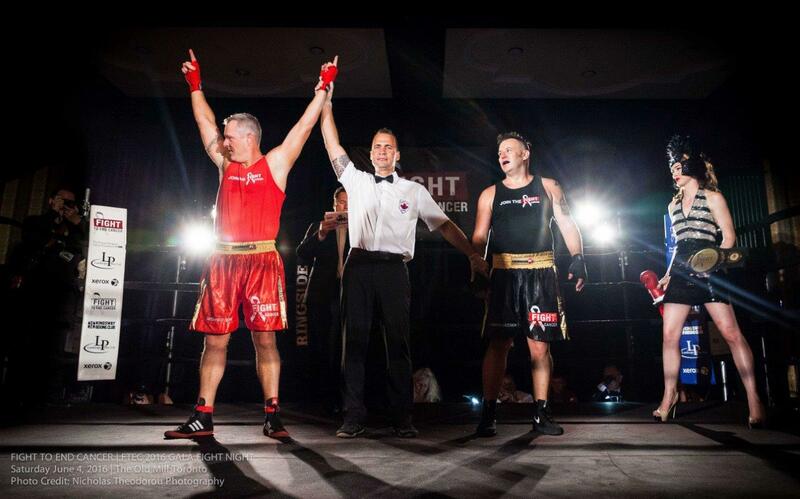 After six months of intense training in Olympic-style boxing, PCL Constructors Canada Inc. (Toronto) project manager Cory “One Punch” Raymond won the coveted main event belt at the Fight To End Cancer (FTEC) black tie charity gala on Saturday, June 4, 2016. Held at the Old Mill Toronto, the sold-out event was hosted by CTV etalk’s Ben Mulroney and brought together some of the city’s top executives and influencers who cheered on five sanctioned Olympic-style boxing matches featuring 10 white-collar men and women with no prior boxing experience. Canadian Olympic-bound boxer Mandy Bujold presented awards for the female co-main event. PCL employees are passionate about making a positive contribution in the communities in which they live and work. Raymond was introduced to FTEC by friend and co-worker, PCL Toronto business development manager Sean Donovan, who trained in the 2015 program and also won the main event. Between the team’s fundraising through personal networks and money raised at the gala, the FTEC committee anticipates being able to donate over $170,000 to the Princess Margaret Cancer Foundation in 2016. On a bittersweet note, event organizers dedicated the evening to boxing legend Muhammad Ali who passed away just prior to the event, in honour of the legacy that he left behind both in and outside of the ring. Raymond frequently referenced a quote by the icon throughout his journey – impossible is nothing. Photo courtesy of PCL Constructors Canada Inc.